This is an ARC sent to me by St. Martin’s Press. It is due in stores….hmmm, I don’t know! But soon! 🙂 I, downloaded it to, and read it on, my Nook Simple Touch. 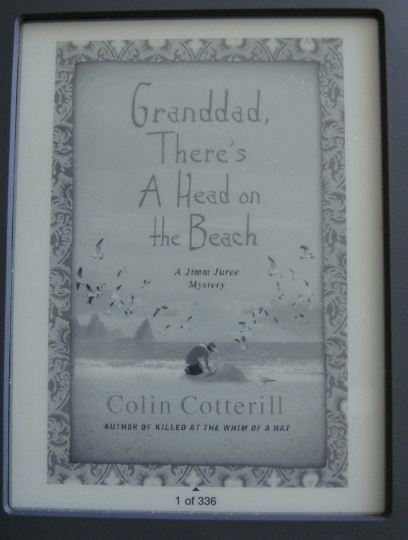 “Grandad, There is a Head on the Beach” is the second book in the Jimm Juree series. I was lucky enough to receive an ARC of the first book “Killed at the Whim of a Hat” last summer, and LOVED it! See my review. I guess I am on St. Martin’s “good boy” list since I got another ARC….and we might be having a book give-away too (stay tuned for that….if it happens). 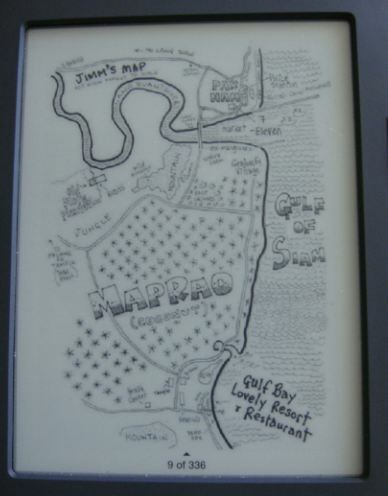 Jimm and her family (see the first book review for a family overview…I will wait) have been living in Maprao (Thailand) for about a year. This day, Jimm and her two adopted dogs are walking on the beach. The small dog Jimm adopted from the temple (Sticky Rice) last year finds something on the beach. He usually eats whatever he finds, but, this item was too big. So he barked at it and danced around. Jimm looks at the item, and decides it was a rubber mask until she looked closer….it was a human head. Jimm finds Grandad Jah (who is watching traffic) and the two of them decide, that indeed, this is a head. Thus starts the story…. The police in Maprao are not the busiest police in the world, nor are they the most honest. The head is taken away, but, as the people in charge of the head leave, they tell Jimm and Grandad Jah that nothing needs to be said about this. Jimm, being a crime reporter, takes offense to this, a knife appears, then Grandad chases them off with a gun shot to their car. +The people holding the head are bad. +A new member of the Maprao police is bad. +Burmese workers are going missing and no one is reporting these missing persons. Jimm is fast becoming one of my favorite female characters. She is smart, pretty, unafraid, and caring. Her family is loving but dysfunctional. The book is a fast read, funny, interesting, tense, and the setting is in tropical Thailand on a beach filled with, hmmmm…..garbage. One of the best series I have ever read (and THAT is saying a lot!). I love Jimm and can’t wait until the next book comes out.